How Do the Fish and Plants Stay Alive? In science, models are often used to test ideas in an easily observed environment. It would be difficult to observe the entire earth ecosystem. 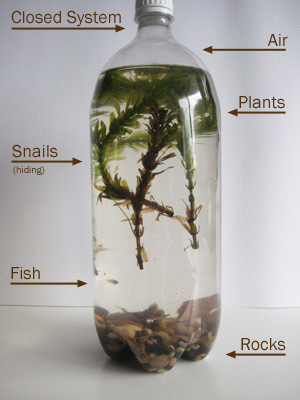 You can make your own bottle ecosystem to observe the carbon cycle in action. Our bottle ecosystem is a model of the larger earth ecosystem. In the picture below we built an aquatic ecosystem consisting of a fish, snails, plants and some rocks. The bottle ecosystem is meant to be a model of the earth. Of course it's much simpler with fewer animals, plants, and not humans, cars, or factories. But this is an advantage. It helps us focus on the carbon cycle with fewer distractions. It is a closed system. No matter can get in or out, including gases like oxygen and carbon dioxide. Even though you can't see them there are gases (like oxygen and carbon dioxide) dissolved in the water. As long as there is sunlight the plants and animals in the bottle ecosystem will survive. We can conduct experiments by changing different factors and observing how the ecosystem changes. Practice these key ideas so you’ll remember and understand better.